MATERIAL - All bench legs are made of heavy duty Arc-welded 2 x 2 x 1/8" angle iron. Available in Green or Gray (specify color in comments section when ordering). FOB Shipping Point. 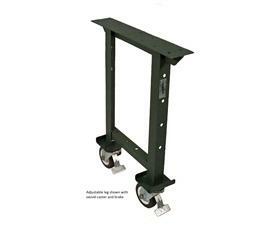 MOBILE BENCH LEGS - 5" polyurethane casters, rigid or swivel with brakes, come standard on all mobile Style 200 Bench legs. Suggested Load Range: 700 lbs. per leg. 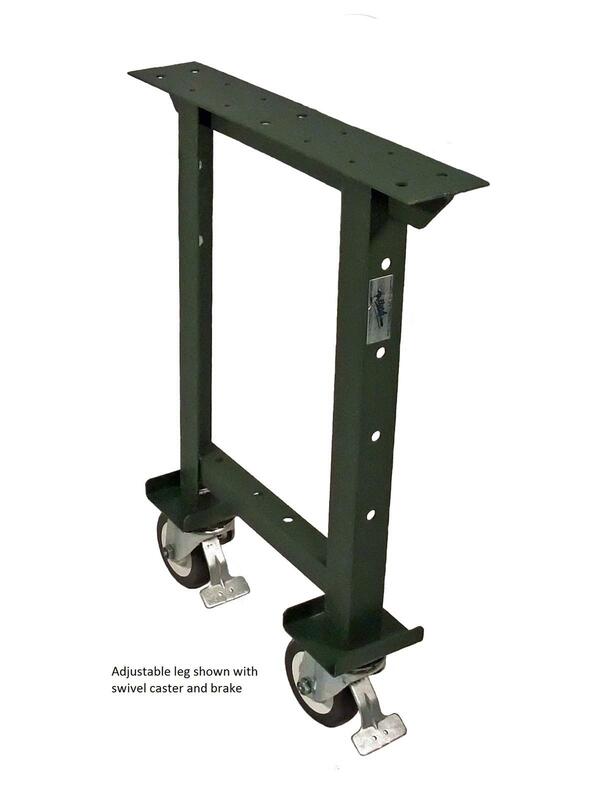 Higher capacity casters are available. STATIONARY BENCH LEGS - are available. Style 209 Stinger - Durable formed 16 ga. steel with 3/4" flanged top and bottom for extra strength and rigidity has (4) 1/2" holes pierced 4" on center for mounting. Style 207 Shelves - Strong 12 ga. steel shelves are formed 1" up in back and 1" down in front and are pierced to match the holes on standard bench legs. Style 220 Bench Drawers - All welded drawer bodies handle heavy load usage as do the full extension 20" ball bearing drawer slides that are welded to a steel cover providing a theft proof top and easy assembly. Available as single drawer or in 2 and 3 drawer units. Padlock attachment standard; cylinder lock, pull handle and sliding drawer tray are available. Style 216 Riser Shelf - 16 ga. shelf 10" W x 12" H with 2" lip formed up in back and down in front for strength. Boxed riser shelf sides provide privacy and mount to steel or wood bench tops. See Related Items tab for Stationary Work Bench Legs and Pollard Work Bench Accessories.